The podium is a modern solution that allows you to delimit living space. And if under the podium there is a pull-out bed equipped with your own hands, then the functionality of the raised platform doubles. Plus, there is a place for small lockers for storing small things. 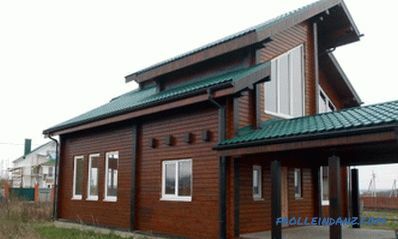 Do not assume that such a structure can be done exclusively in small apartments. 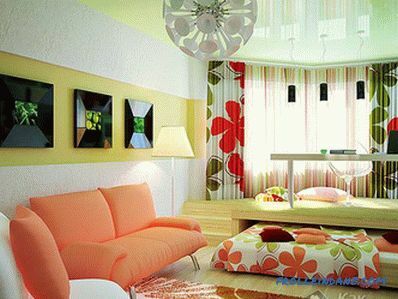 Such a solution will revive any interior even in a large room / apartment! Moreover, an extra bed will never hurt in case guests or relatives arrive. 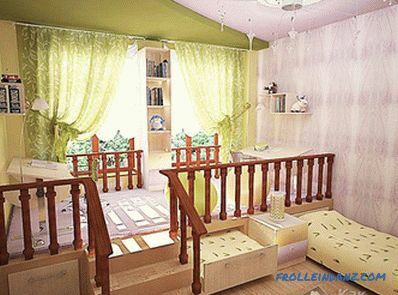 This design can be assembled in a rented apartment, because there is no need to raise the floor and make an opening in the wall. So what preparatory work needs to be done to make a pull-out bed, and how is the manufacturing process itself? A framed podium that was mounted on vertical, solid sides. 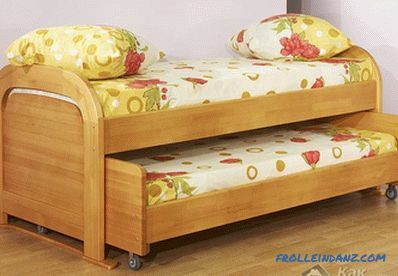 Pull-out bed with a mattress on rollers. There can also be several drawers for bed linen, books and the like. Several additional corner and side drawers. A ladder of one or two steps. 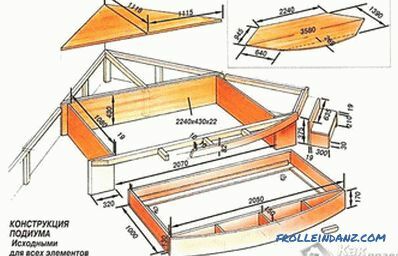 In this form, there will be a ready-made construction with a pull-out bed. Consider the dimensions of the purchased mattress. In fact, the place above the bed and near it will be a kind of dead zone, since it must be pulled out at night without any obstacles. 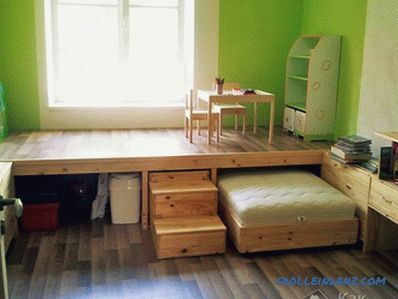 The height of the mattress and the flooring will be 45 cm. 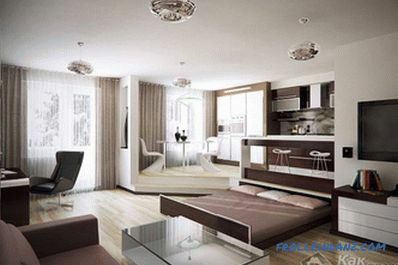 This height is sufficient, since the standard apartment has a height of 2.30 m. A man of medium height will feel completely comfortable. And from above you can easily place a computer table and chair. Bar 40 * 60 mm 25 m.
Furniture panel: thickness 22 mm, size 600 * 3000 mm in duplicate. MDF plate: thickness 19 mm, size 2070 * 2620 mm in duplicate. Furniture castors are two pieces. Acrylic paint and furniture lacquer. The dimensions shown here are conditional. In your case, the dimensions may be different! First, a support structure is assembled, which is installed along the wall. It should die out straight. Directly on the floor marking is performed for the bed. These measurements can be traced. In order to place the support rails in their place, dismantle the plinth. 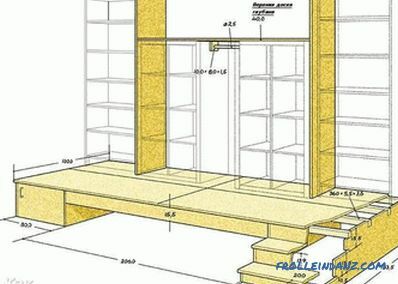 Now, along the entire perimeter of the flooring, vertical stands of timber are mounted. Depending on the expected load, adjust the pitch of the racks. If you have two or more children, then, of course, you cannot drive them off the runway. For this reason, place the racks in 40 cm steps. 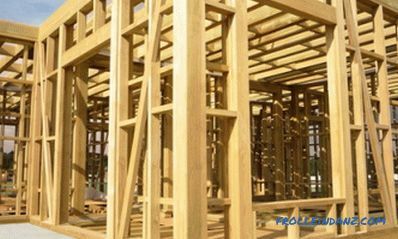 What As for the height of the uprights, it should be less than the ground exactly on the thickness of the timber. Mount the horizontal bar on these supports from above. All this construction must be attached to the wall with dowels. 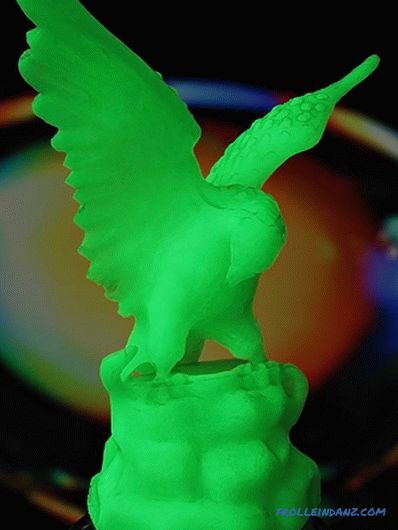 As a result, a sufficiently rigid and sturdy construction will be made. The bed is marked on the shield and MDF panel. From the slab, you will need to cut the following elements: the lower base of the bed, which will be rounded at the front. To do this, use an electric jigsaw. The cover for the podium can be cut from the furniture board. Each saw cut is recommended to clean, so as not to drive a splinter. To reinforce the shield flooring, cut the sides. According to the markup, these bumpers are attached to the floor of the podium. Next, from the timber 40 * 60 mm to the edges of the flooring paste stiffeners. The board will have a height of 430 mm.Wall bed 130 mm. Mattress height 200 mm. As a result, the height of the bed with a mattress will be 330 mm. In order to avoid difficulties when rolling out the bed, the side of the flooring can be additionally reinforced with ribs: crosswise or longitudinally. The glue should dry well. After that, cover the sides with a layer of varnish and only then install the structure on the legs. It will be necessary to select grooves under the carrying bar. They will serve as a support for a triangular niche cover. At this stage, the slatted grid for the mattress is assembled. Screw the chipboard strips to the rack base. Assemble the facade of a semicircular shape from two pieces of the slab. Each of the segments should be secured with screws. Between the frame of the bed and the rounded front of the bed, insert the stop, which is cut from the remnants of MDF. Now it remains to fasten the furniture rollers to the lower base of the recumbent seat. And the details of the timber attach to the front bottom of the bed. The bed is ready! Finally, cut out the step and fasten it screws. Triangular covers should also be cut into the corner niches. When all this is done, you can check the bed for functionality, rolling it out. If everything is working properly, you can continue to work. Screw the side ends of the flooring to the wall frame beam. In the finished grooves, glue the carrier rail, which is necessary for laying the triangular cover. In addition fasten all this construction with screws. 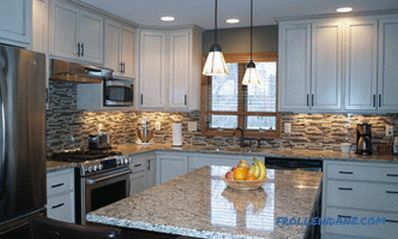 In niches located in the corners, it is better to store seasonal items. Since access to these niches is required only a few times a year. In these places it will be possible to install furniture. A ladder is installed at the end and the work is completed. The framed frame should be beautifully finished. To do this, the entire surface must be treated with a primer on wood, for example, linseed oil. The surface should dry. Then paint the surface in two layers. If you don’t like painted surfaces, you can lay carpet on the floor of the podium. To do this, evenly distribute the carpet on the surface of the podium. Over the entire length, press it with a heavy object. Then make a markup that will exactly repeat the outline of the whole structure. 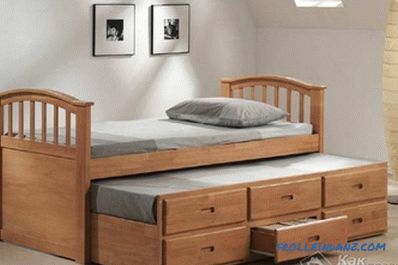 In places where the podium bed has rounded seats, work extremely carefully and carefully. For cutting the carpet, use a sharp knife. Each edge can be further processed, for example, braided cord or something else. 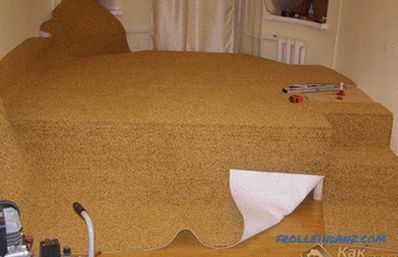 When you have fully fitted the carpet in size, it should be laid on the glue so that it does not move. This is how a pull out bed is made. 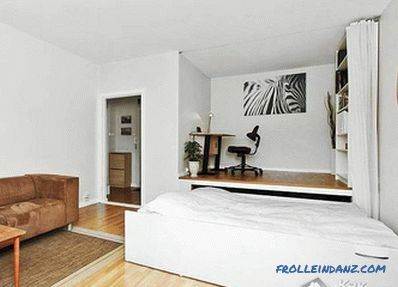 Literally on four square meters, you can organize a workplace on the podium and a pull-out bed under it. As you can see, making a pull out bed is not so difficult. It just takes a little patience and effort.